This is a bit strange, I’ve never reviewed a repaint of a figure that I’ve reviewed before. But here we go. 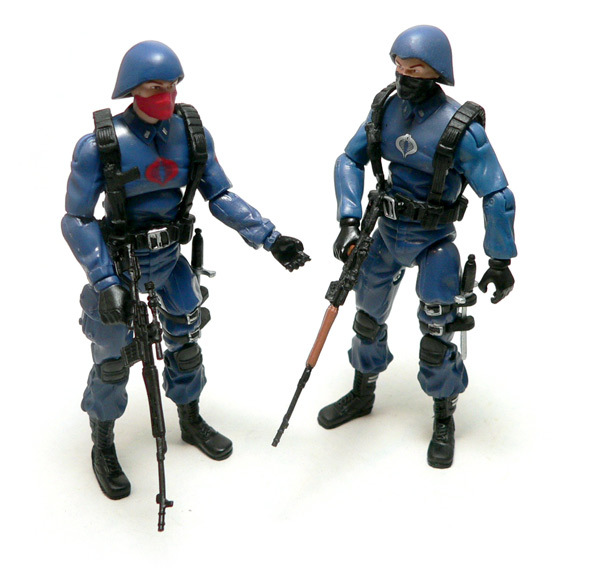 This version is carded as Cobra Infantry. 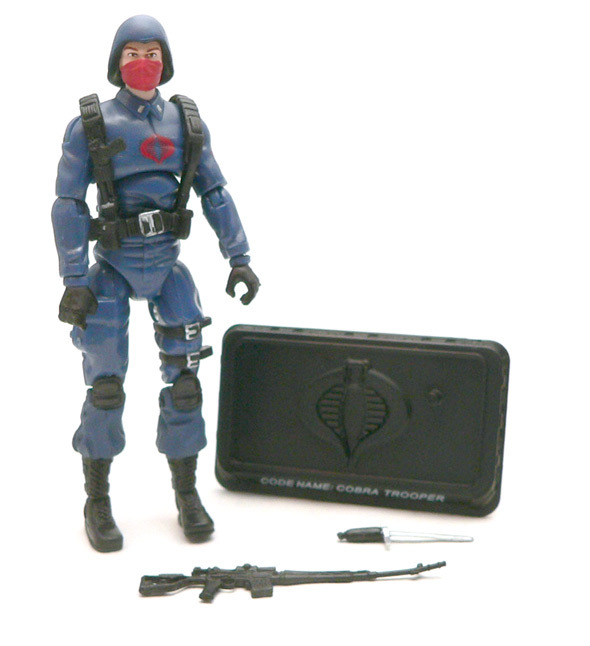 The original figure I reviewed was more in line with the vintage line, calling the figure Cobra (The Enemy). You can read that review here. Why would I buy a repaint? Normally, it would be to get a specific look for a specific character. However in this case, it is neither. I purchased him because of a $3 (US) price tag and he’s a good army builder. The main differences in this version are of course mainly in colors. This starts with the body. The blue on this guy just seems a tad brighter reminding me more of the cartoon. A nifty feature of the blue is that his cuffs are painted to match on his hands. The previous had black cuffs. The most notable change is the face covering being red. While this doesn’t seem very stealthy to me for battlefield gear, it does show off the sculpt a little better than the black does. The down side of this version of the masked bandit look is that the neck isn’t painted. While this might be true to some parts of the cartoon and comic book, it looks a tad goofy on the figure. Unless he some sort of magical elastic to hold that thing in place, it looks like it is just floating there. 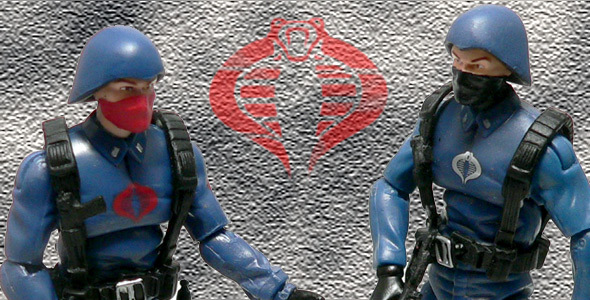 One improvement in paint is the Cobra crest on the front of his uniform. It’s larger that the other version, which is one of the improvements needed I mentioned in the original review. It’s in red as well, which just seems more Cobra-ish. There’s a second Cobra insignia on his left arm. Why this was included, I have no clue. A rank or unit patch would make sense. But two Cobras? The silver seems to have some small issues. The buckle on the harness is done very sloppily. Also, the silver details on the boots from the previous version are missing. 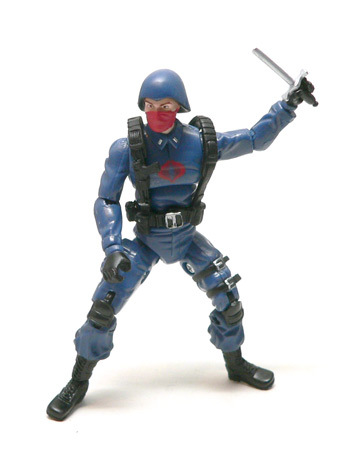 On the upside, the buckles on the knife look better on this figure. One of the smallest changes in paint makes a big change to the look of this figure. It’s the eyebrows. The other version has a bit more arch to his brows that give him an evil soldier intent on destroying his enemies. This version just looks like a standard worker bee. I really think the arched eyebrows are needed to get menacing look of the card art. Generic soldiers are always fun. 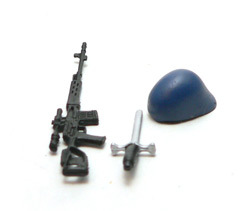 They fill out dioramas and give kids cannon fodder for play scenarios. If you can find this guy in the bargain bin, he’s worth picking up for those reasons alone. While he has the same accessories as the other version, there’s something missing. The paint on his rifle. With out it, it just looks a little cheaper. Also, mine seems to have been a little too long in the blister and has a bend to it. The rest of his gear is comprised of a helmet, knife. and base. Personally, I think all G.I. 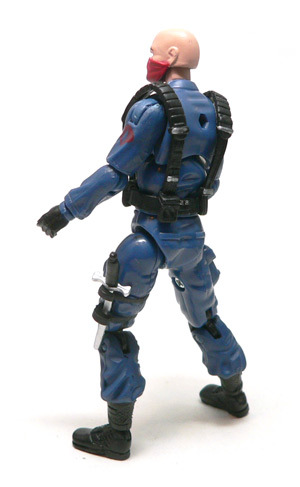 Joe figures should come with backpacks. I would imagine this soldier is of the variety more suited to guarding the Terrordrome than slogging through the jungle, so I guess it’s okay he’s sans pack. Maybe I’m warming on this guy a little. Maybe it’s the larger Cobra logo. I like him just a tad bit more than the original figure I reviewed. Not much, but a little bit. 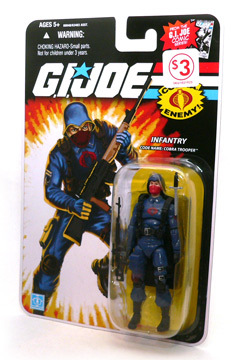 If you can find him in a bargain bin, he’s a definite must buy, if for nothing else but to fill out your Cobra ranks.